/Before Placing my Order /Do you offer free samples? Yes, you can order a free general sample pack by filling out a short form here. 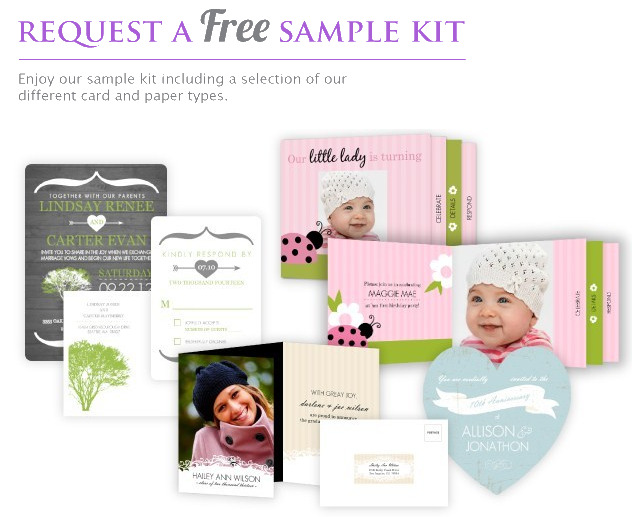 Our general sample pack includes a variety of stationery items. They showcase samples of our different designs, paper options, die-cut options, and premium card types, like booklet and tri-fold cards. Learn more about ordering a free sample pack by following the link provided. PurpleTrail is unique in the fact that we allow our customers to order a personalized sample. Other websites provide free samples with stock photos and wording, but we let you personalize every aspect of your card or invite for a small fee. This is something you won’t find anywhere else. If you want a sample of a personalized card design with your photos, custom wording, and more, you can order one during checkout. Simply personalize any card and then select “Order a Sample” from the Select Quantity drop-down. You can order as many personalized designs as you like. We highly encourage customers to order a personalized sample of their stationery before placing their full order, because it is a great way to check color, photo quality, and paper.